11.08.2003 - Florida is home to many non-native species of plants and animals. People seem to become particularly excited about the presence of non-native snakes. It's true that Florida is host to several species of foreign snake. The subtropical climate allows for survival of certain species that usually only live in jungles in areas such as central and South America, such as snakes. One such snake is the Boa Constrictor. This is a very well-known snake, and is a member of the Boinae family. 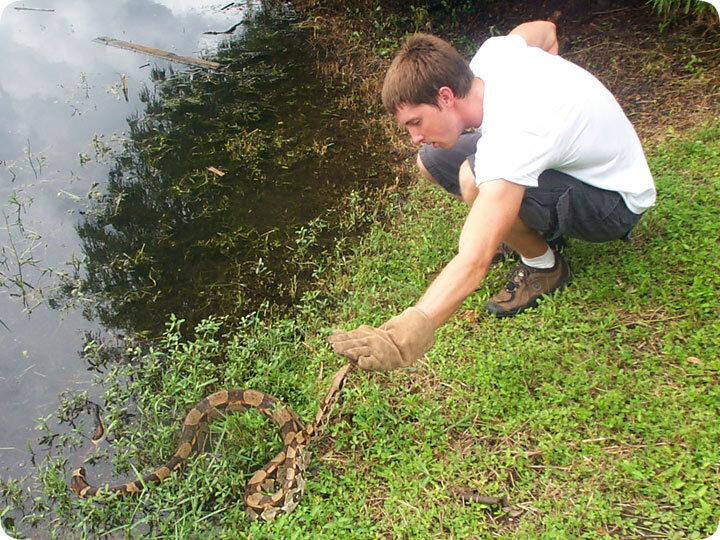 It's not nearly as large as the Reticulated Python or the Anaconda, or even the Burmese python, all of which have been found in the state of FL at varying times, but it can grow to a fairly large size, up to 12 feet, even a little more at times. Above is a photo of a Boa Constrictor that I caught here in Orlando Florida. It was about 6 feet long. Here I am playing with it near a lake in Orlando. The big question is about the origin of this snake. Was it a released or escaped pet, or was it born in the wild here in Orlando Florida? I'm going to guess that this particular snake was a pet. While it's true that some species of python have in fact established breeding and sustained populations in southern Florida, I just don't think that Orlando is quite warm enough for these snakes. In addition, I've only come across them on rare occasion. I think that if they were breeding here, I'd see them more often, and I'd see more small boas than I do. I think larger ones such as this are merely pets whose owners released them, because they got tired of keeping a large snake around. However, I'm not sure that I'm correct, and it's possible, even if this Florida Boa Constrictor pictured above is a former pet, that there are boas in the Orlando area. As for the rest of Florida, I do believe that there are self-sustaining populations of Boa Constrictor in southern Florida, along with the established Burmese Pythons in that part of the state. Get professional help: Visit my Nationwide Pro Directory of wildlife removal experts. For more wildlife stories, click my Wildlife Blog or click my below banner to hire a local trapper.